Keeping your child busy during the winter months doesn’t need to be challenging. In fact, there are a number of sports clinics you can choose from. One popular option for boys and girls aged 6 to 13 is a sports clinic focused on basketball. 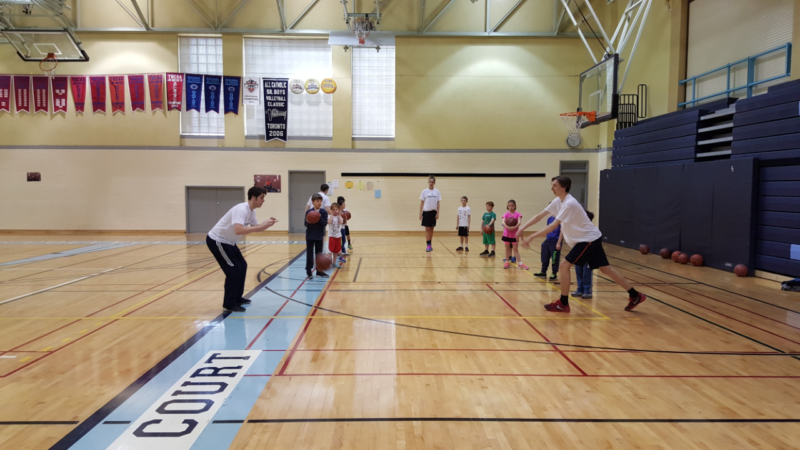 Whether your child has already discovered their love for shooting hoops, wants to emulate their favourite NBA stars, or is just starting out with the very fundamentals, a clinic is a great idea. Sports clinics help children develop a number of different skills that apply both on and off the court. Here are six different skills your child will develop at a basketball-focused sports clinic. Dribbling the ball is one of the fundamentals of playing basketball. Any good player knows they need to keep the ball moving if they want to keep moving. Most children start by keeping the ball in motion while they stand still. This helps develop another important physical literacy skill: hand-eye coordination. Eventually, through the practice gained by participating in a clinic, children will add in their own motion, dribbling the ball as they make their way up and down the court, as well as advancing to include cross-overs and dribbling with both hands. Basketball skills also include the essential team sports move: passing. Children will learn the different types of basketball passes including chest pass, bounce pass, and overhead pass. Furthermore, they will learn how to pass the ball over increasingly long distances, and this has some great real-world applications outside of sports. Your child is learning how to effectively judge distance, which is an indispensable part of physical literacy. Even if they don’t grow up to be an NBA star, basketball gives your child the opportunity to develop some fundamental movements! This is the glamorous part of basketball—your child will eventually get to practice their shot. In fact, they’ll take part in a number of drills to improve and practice different kinds of basketball shots at a sports clinic, including layups (Most important), jump shots, hook shots, free throws, and bank shots. They may not be making 3-pointer jump shots by the end of the clinic, but they will definitely have some time to practice one of the most essential basketball skills. Basketball requires players to maneuver their way up and down the court, often dodging opponents. They twist out of the way, turn and shield the ball, then duck around an opponent. Defenders need to be on guard, always on their toes. Some people might think basketball is “nothing but net,” but actual play requires a good deal of agility. Your child will have a chance to work on their footwork through a number of drills designed to improve both their defensive skills and offensive play, as well as a develop a fundamental movement not as common in other sports: jumping. Basketball is a team sport, so, of course, one of the essential basketball skills is good teamwork! At a sports clinic, your child will have ample opportunity to develop great teamwork skills by participating in drills with partners and in groups. Working together, clinic-goers will help each other improve not just their basketball skills but other key life skills too. Learning, understanding, and applying rules is key to any sport. Learning about rules in sport can teach children self-control and discipline. A player who flouts the rules won’t be welcome on the court very long and won’t earn the respect of his or her peers. Practicing self-control and abiding by the rules on the court can also be applied off the court. Children who participate in sports may find it easier to follow rules at home or in the classroom. There are a number of basketball skills your child can learn at a sports clinic that apply both on and off the court. Camps and clinics are great opportunities to get kids playing and moving!